The 2017 World Press Photo named its winners a few days ago. 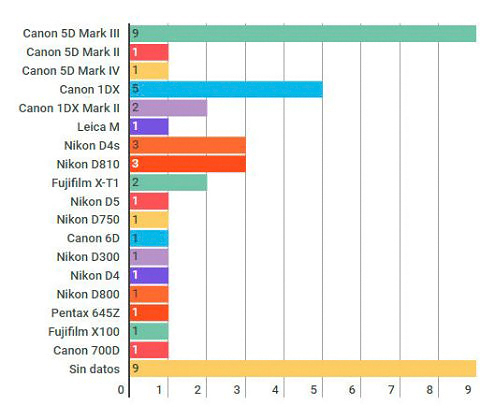 The camera winner is definitely Canon, in particular the EOS-5D Mark III. Canon cameras were used in 20 winning photos, compared to 10 photos for Nikon, the nearest competitor. Canon is the preferred brand in the world of photography, be it in sports, wildlife, landscape or the press. It is not surprising the EOS-5D Mark III was used so often. I have picked it as the best value, full frame DSLR four years in a row. You can see how it compares to the Nikon D810 and the Canon EOS-5Ds cameras. But without a doubt, the Canon EOS-1D X Mark II is the best camera for sports and wildlife photography. Great list you have posted about the camera mostly used by the people in the world, it shows the quality of the camera according its users. Get the offers of top quality CAME-Mini at the best price. The photo is as good as the eye of the photographer. Good equipment helps but circumstance and skill are more important factors. Really a great photo. You will get nikon camera at low price in Price-hunt as compared to Nikon d3400 price in india. Go and and buy one at reasonable price.